Contruction Date: Botanic Garden site established in 1934; Japanese Garden begun in 1970. 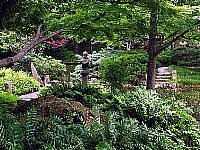 Japanese Garden: November - March, open every day except Christmas, 10am - 5pm; April - October, open every day, 9am - 7pm. Entry gates close 30 minutes prior to closing time. Tour groups and special activity groups pay regular admission on weekdays.